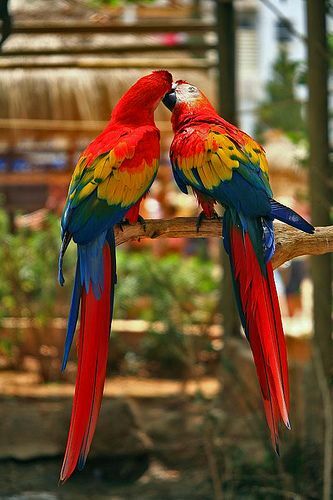 Parrots are colorful, lively and playful pets. There are more than 350 different types of parrots; they range in color from vibrant red and green to stately gray and black, and can be quite small (about 3 inches or almost 8 centimeters) or quite large (up to 40 inches or more than 100 centimeters). When given plenty of living space, exercise and positive attention, these extremely intelligent birds are very affectionate toward their owners. Most parrots have an uncanny ability to mimic human voices, as well as other sounds. Don't be surprised if your parrot begins to imitate a barking dog, a mewing cat or even your cell phone's distinctive ring. Housing and Exercise: Cage should be large enough for bird to fly short distances and should be cleaned every other day. Lining the cage with a thin layer of gravel will aid in the cleaning process -- and the parrot's digestion. That's because ingesting an occasional piece of gravel helps a bird grind seeds in its belly.